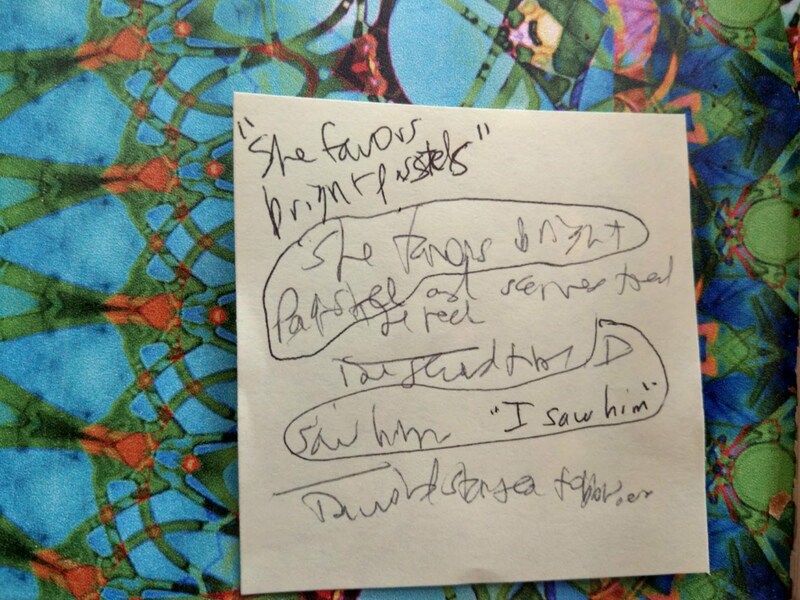 When I'm about to go to sleep, I'll pretty frequently get phrases of dialogue or descriptions in my head, so I've tried to train myself to reach over and write the phrase down on a Post-it note. However, given how sleepy I am, I often struggle with deciphering what I wrote. The first part that's circled is "She favors bright pastels." The next two words kind of look like "and serves," but that doesn't ring a bell at all (the bright pastels do, though). The second circled part is "I saw him." The rest is gibberish, but I remember feeling that those phrases were going to be useful in some piece of writing, so I'm crowd sourcing the detective work. If you can figure out what the rest says, you will receive both my eternal gratitude (in lieu of actual compensation) and a mention as a first-rate sleuth here on the blog.